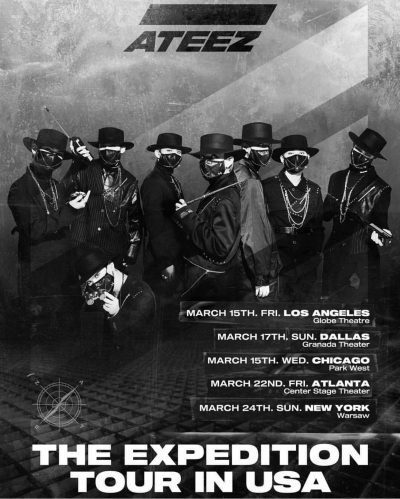 Rookie Kpop group ATEEZ, who only debuted in October 2018, announce U.S. tour! ATEEZ, group of 8 members who were originally named KQ Fellaz went viral in May last year for a dance performance video. The group didn’t even debut yet and they stole hearts all over the world with the two part dance video sequel uploaded to YouTube. You can watch the videos here! Already onto their second album TREASURE EP.2: Zero To One released earlier this month, the group has just celebrated their 345k reach of followers on Instagram and named their fandom ATINY. Hits ‘Pirate King’ and ‘Hala Hala’ have won over hearts worldwide. Now with one of their new releases ‘Say My Name’, they have also started a dance challenge for people to recreate on social media, you can read more about the #Driving_Dance_Challenge here! It isn’t the first time they’ve gone viral online! Who’s your favourite member of rookie group Ateez? And what is your favourite song so far? Will you be attending their upcoming concerts? Let us know in the comments below! ATEEZ gear up for their first comeback ‘Zero to One’ with new teasers!